It's not long now, until . . .
★ The inimitable Paul Harper and special guest Don Gentel singing old-time festive favourites. ★ Homes & Antiques magazine on offer at half price for the current issue, back issues only £1.00, and FREE Christmas Carol CDs and notebooks with magazine purchases while stocks last. ★ Eight new-to-VV vintage traders! Say hello to 5859, French Vintage Heaven, Pop Culture 101, Little Red Vintage, Mary Jones Vintage, Miller Bezzant, Deanna Slater and The Way We Wore. ★ UPDATE! : we'll have a Random Christmas Gift Giveaway running throughout the day! If you come through either one of our doors when the egg-timer goes off, you will get a little Christmas treat! Scrumptious hot food is available from the world-class, award-winning Lord of the Pies and another new-to-VV vendor Fat Annies with their hand-made, gourmet hot dogs with artisan bread and their own pickles, relishes and sauces. Reviving espresso-based beverages and teas will be supplied by Kandoo Mobile Coffee, and award-winning Stuart Thornley Cake Design has some exceptional Christmas treats for afters (see his menu below). Or firsts, we're not here to judge. All dogs come with butter braised onions and our signature pickle on an artisan brioche bun. Help yourself to the selection of our very own kraut, toppings and sauces. Cupcakes including our December Specials, the Christmas Collection – Gingerbread * Rum & Raisin * Baileys * Mince Pie. Plus the Christmas Dinner Collection - a box of four, each cupcake being a course of your Christmas dinner – Bucks Fizz * Tomato & Basil Soup * All The Trimmings * Mince Pie. Let us know you're coming on our Facebook event page (if you do that sort of thing)! NEW! 5859 - vintage homeware, fabric, photographic items, collectables, print and anything else that looks fun! Animal Sanctuary Wilmslow - charity calendars raising funds for the Animal Sanctuary. Anntwackey Vintage - women’s vintage clothing and accessories, 1940s-80s. Aspidistra Vintage - mid-century homeware, clothes and jewellery. Boland’s Bygones - vintage linen, lace, haberdashery, small fashion items. NEW! Deanna Slater - vintage clothes, linen, glassware, pottery and Bakelite items. NEW! French Vintage Heaven - vintage French curios, collectables and homeware. Garrick Books - old books. Gem’s Bits n Bobs - ladies’ and gents’ apparel, bric a brac, toys, annuals, dead stock jewellery. Homes & Antiques magazine - special deals on the day, see above! Jim Wilson - collectables, homeware, oddities and curiosities. 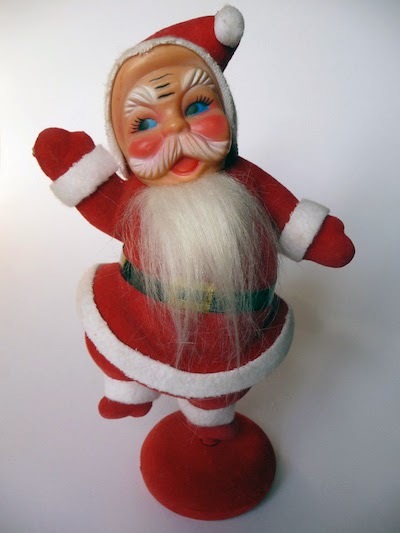 Karen Mercer - collectable vintage treasures. Lace & Liquor Vintage - vintage women’s clothing and accessories 1940s-70s; mid-century homeware. NEW! Little Red Vintage - vintage clothing and accessories, 1950s-80s. NEW! Mary Jones Vintage - vintage and glamour from the roaring twenties to the swinging sixties. NEW! Miller Bezzant - women’s vintage clothing 1950s-80s; textiles, accessories and handbags 1930s-70s; vintage patterns and sewing books. Modernist Mid-Century - a range of iconic mid-century items: original film and other posters, glass, ceramics, objets d'art, records, homeware, etc. Ophelia Button - vintage fashion, homeware, dolls house furniture and clothes; handmade cards, peg dolls, Christmas angels and glitter toadstools. Penelope Cat Vintage - vintage homeware, books and clothing 1940s-80s. NEW! popculture101 - Eclectic mix of cool film and TV related pop culture items, from annuals to board games, magazines to toys. Retrorags - vintage women's and men's clothes, bags, accessories, homeware. retrospektiv studio - quirky and eclectic mid-century and vintage homeware and small furniture. Rita Black - vintage homeware and small furniture. Same As It Ever Was - men’s and women’s vintage clothing and accessories, 1960s-80s. Sarah’s Second Chance - vintage collectables, homeware,costume and jewellery. Shabby Cheek - gothic curiosity shop. The marvellous Paul Harper will be here to serenade you! Photo by @AspisitraVint. 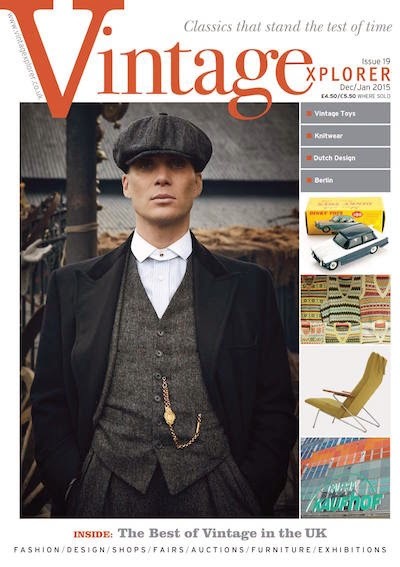 We're guessing that the new Dec/Jan issue of Vintagexplorer will be popular! Get your FREE copy at our No Sleep 'Til Christmas Fair, at TinTrunk's unit in Room at the Top Vintage Goods. 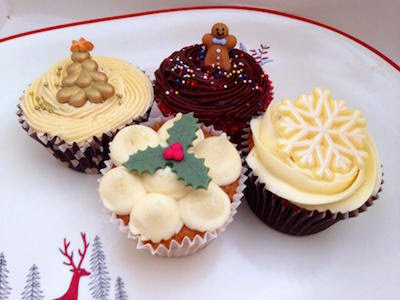 New for Christmas from Stuart Thornley Cake Design: Mince Pie, Rum & Raisin, Gingerbread and Baileys cupcakes. 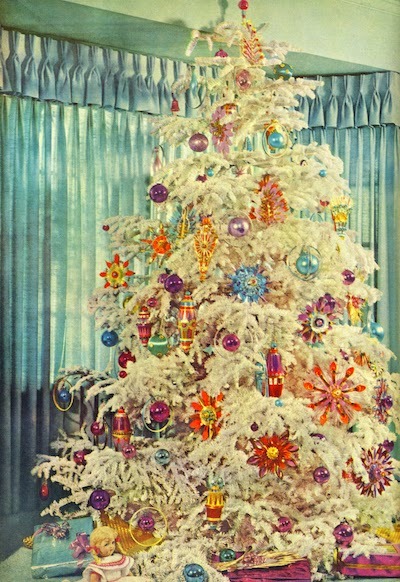 Now that's what I call a Christmas tree! Source. 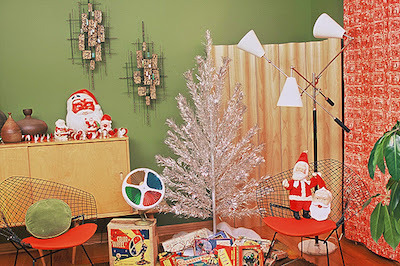 A marvellous mid-century Christmas room. Source. Stuart Thornley Cake Design - voted the most popular trader at the Vintage Village, see this month’s specials above. Suzylovesmilo - bright women’s clothing and accessories, mainly 1980s; homeware from the 1960s-70s; handmade goods from upcycled and new materials. NEW! The Way We Wore - genuine vintage clothes, shoes, accessories and household items, mainly from 1940s-80s. TinTrunk - a growing range of top quality 20th century leather luggage plus costume jewellery, homeware, textiles, collectables. Find TinTrunk at Room at the Top Vintage Goods. Value Vintage - bits and bobs, haberdashery. Vintage Advertising & Prints - a wide selection of original advertisements and prints. Vintage Clutter - vintage haberdashery and accessories. Vintage Gift Shop - 1920s-80s ceramics, glass, silver and gold jewellery, clothing and accessories, textiles, musical instruments. Vintage Hopes - vintage women’s and some men’s clothing from 1940s-80s. Wax Delirium - vintage vinyl. Whittaker & Gray - mid-century vintage and retro furniture and homeware.